Cyclo Nord-Sud collects used bicycles for vulnerable communities, furthering social and economic development, with an environmental perspective, through local and international projects. 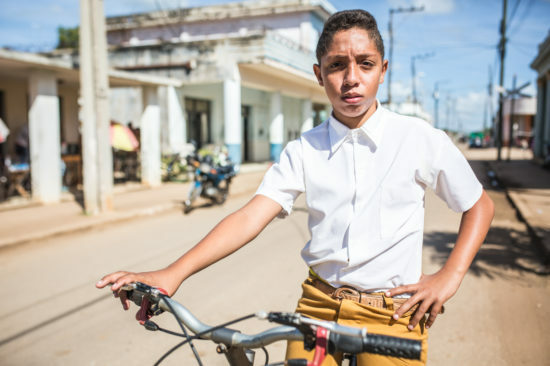 Since its founding in 1999, Cyclo Nord-Sud has delivered more than 57,000 bicycles to 20 countries in Africa and Latin America, principally to rural areas where transportation issues are greater. In the south, a bike is used by five to ten people, besides its owner, and has a lifespan of more than 20 years. It can carry more than ten times its own weight. The basic parts (frame, handlebars, drive, wheel spindles) are resistant and are less likely to break. The operating parts (tires, inner tubes, brake and pad cables, chain) are inexpensive, interchangeable and easily accessible on the market. Even when they are dysfunctional, bicycles and their parts can still be useful in making different tools such as water pumps, washing machines, winches, generators, fans, grinding and sharpening mills, etc. Our actions don’t stop there, as we develop projects for local communities. The Vélorution Saint-Michel project offers services with the purpose of encouraging and enabling daily cycling in the neighbourhood. It offers introductory cycling sessions, bicycle mechanical training, cycling trips, and many other services! Cyclo Nord-Sud is an initiative of the Société d’éducation pour le cyclisme à Montréal, a non-profit organization founded in 1988 by Claire Morissette, leading figure of the Quebec environmental movement and co-founder of the carsharing service Communauto. History reveals us that the bicycle was, at the end of the nineteenth century, an important tool for the liberation of American and European women. Find out more. Promote greater equality, and especially, provide women in vulnerable communities with bicycles and other means to further gender equality and encourage community development. Provide bicycles and the necessary skills to individuals, thus empowering them to be active forces in the development of their communities and to improve their living conditions. Raise people’s awareness of the social and environmental issues surrounding mobility. Integrate elements of environmental and global citizenship education, our two main areas of expertise, in all our projects. Mobilize citizens to use the bicycle in order to have a positive impact on society as a whole, both socially and environmentally. Address community needs without compromising the well-being of future generations. Encourage the use of bikes, an active mode of transport, along with other sustainable means of transport. Ensure that our actions respect environmental, human, and economic resources. Pursue a humanitarian approach based on solidarity and cooperation, with the aim of empowering our partner organizations and the vulnerable communities they support, through access to resources and competencies related to bikes. The organization has the status of registered charity (No. 13096 4786 RR0001) issued by Canada Revenue Agency. It promotes cycling as an appropriate mode of urban transport, based on ecological, urbanistic, economic, health, efficiency and convivial principles. Cyclo Nord-Sud received the Level 2 certification from Recyc-Québec in November 2014, recognizing the efforts made to promote sound waste management. Help us to spread our actions !